Every time the lovely ♥ Rachel ♥ stops by the blog, she always has fantastic bits of author news that I haven’t heard elsewhere, so I was thrilled to hear she wanted to cover the Los Angeles Times Festival Books for us. I just like to say thanks again to Wendy inviting me to share my experience! This was my first year attending the Festival, so I was pretty excited to go. So armed with sun block, a camera, and my husband’s muscles (books are heavy!) I was ready to tackle this large event. I had read schedules, knew which panels I wanted to attend and which authors I wanted to stalk for signatures. In the end I went to three different YA panels. They are set up like a book signing, but they have a moderator there to direct the discussion and ask questions. This is nice because often they ask questions you wouldn’t even think of, and it keeps the panel lively! I also met some authors who were signing at booths all over the event. Kendare Blake signs a book for Rachel! Abby McDonald is a spunky Brit who wrote Getting Over Garrett Delany, a contemporary YA novel I read earlier this year and loved. Even though I’d met Marie Lu at the HarperTeen Spring Into the Future signing, she still managed to surprise me with interesting tidbits. As an aid to her writing, she sketched out characters and the city of Los Angeles as depicted in her book, Legend. Some of the authors that I got signatures from were Maureen Johnson said The Name of the Star is definitely a trilogy, possibly four books in all. Kendare Blake said that if she could cast Anna, the title character from Anna Dressed in Blood, her dream actress for the movie would be Summer Glau from Terminator: The Sarah Connor Chronicles and Firefly. Deb Caletti was such a sweetheart, who said that the family in her new release, The Story of Us, is a mash-up of her own family. Being a supreme “vanilla” lover, I thought it would be great to give away a signed copy of Deb’s book here on The Midnight Garden since it just released this last Tuesday. Good luck! Win an Autographed Copy of Deb Caletti’s THE STORY OF US! To enter, simply fill out the Rafflecopter form below. As always, you can earn extra entries by tweeting about the contest, sharing it on Facebook, etc. We never have those events here…:( Lucky! Sounds like a great time! I hope to make it next year. Rats Saw God is my favorite YA Contemporary (well, it was contemporary at the time). I’m so jealous of you right now. I haven’t been to a bookish event yet and really want to! Man I wish I could have been there! All my favorite authors were there! Awesome giveaway. Definitely Anna and the French Kiss! Such events are always so much fun! Favourite contemp has got to be Anna and the French Kiss, absolutely love me some english boys, heh. Always been dying to start on If I Stay by Gayle Forman. Aww. such events are always so much fun. I REALLY loved Anna and the French Kiss by Stephanie Perkins. And I can’t wait to start on If I Stay by Gayle Forman. My favourite contemporary…..Twenty Boy Summer by Sarah Ockler! It was sad, yet fun, story that I don’t think I will be able to forget! My favourite contemporary novel is probably If I Fall by Lauren Oliver (although I’m not sure if it’s really classified as YA contemporary). It was an amazingly written, touching book that I always recommend to others! I really enjoyed The Statistical Probability of Love at First Sight, but I’m not sure I have a favorite… yet. My favouite YA contemporary novel is Anna and the French Kiss! I really really ADORE and LOVE this book + the swoon-worthy Etienne St. Clair! I’m not much of a contemporary reader but one book which I guess could fall into the category is Jellicoe Road by Melina Marchetta. I LOVED that book. Aww, thanks Sam. I know you’re not a huge fan of CR but your pick is a winner! This is a great blog, I’m really excited about this giveaway! This is a great blog, I’m really excited about the giveaway! My favorite comtemp is The Summer I Turned Pretty series! I can read those books over and over again! Japrit raves about this series too, Savannah. I have all three books, so I really should read them! This sounds like it was a great event! I wish there were more events in my area. Though I have to say I found out about a few that were this past weekend, but it was a little late. :( Thanks for the great recap!! Ah, when was this? I wish I could’ve gone. Thanks for sharing – I’ll have to keep my eye out for event like this. My favourite contemporary YA novel would probably be If I Stay by Gayle Forman and Thirteen Reasons Why. I also loved, loved Wanderlove this year. Thanks for the recap, Rachel. I was so disappointed that I missed it! I was dying to see Patrick Ness. Bummer, Maggie. I’m sure you’ll catch other events, though. There seem to be so many where we live, right? You picked two Aussie favorites of mine! Love Thomas McKee! Graffiti Moon had me both swooning, and laughing so hard, I was crying! The whole bicycle scene in the park was priceless. My favorite YA contemporary novel would probably have to be a toss up between Thirteen Reasons Why by Jay Asher, Jellicoe Road by Melina Marchetta, and Ballads of Suburbia by Stephanie Kuehnart. i’d say sea change! thank you for the contest! The festival sounds so amazing! And I’m totally jealous that you got to meet Kendare Blake! I loved Anna Dressed In Blood. =) My favorite contemporary novel has to be Anna and the French Kiss, or 13 Reasons Why. Both are totally amazing! Stephanie Perkins seems to be a favorite for all of our ladies! Anna and Lola where amazing for me too. Can’t wait for Isla! I absolutely LOVE Anna and the French Kiss and Lola and the Boy Next Door….great stuff!!! Does If I Stay count? If not, then The Piper’s Son, mostly because of Georgie! Rachel is awesome for sharing about this. What an amazing event. Wish I could have been there. Contemporary YA? Lately, Pieces of Us by Margie Gelbwasser. Thanks. My favourite YA contemp is Anna and the French Kiss by Stephanie Perkins. It’s filled with great, loveable characters and I absolutely loved the entire thing. Thanks for the giveaway! My fave YA contemporary books… Pretty much all of Melina Marchetta’s books. I just fall in love with her stories & her characters. I also really love Split & Five Flavors of Dumb. rocksann, Marchetta is definitely a god. I wish she’d hurry up and write more books I’ve run through them all! Sounds like a fantastic event!!!!! I love all the pictures! My favorite contemporary book series at the moment is The Ivy series by lauren kunze. My favorite contemporary stand alone right now is Take A Bow by Elizabeth eulberg. Fav contemporary? Probably Flat Out Love. Looking For Alaska is my favourite contemp. Thanks! Rachel, I just popped over to Goodreads to check out Take A Bow, it looks good. Sort of reminds me of that movie Center Stage. If anyone is interested, you can enter to win it on Goodreads right now until April 30th. Never heard of that one, Fara, but I love it when a story incorporates music in the story! I’ll have to check it out. Looks like you had a great time, Rachel! 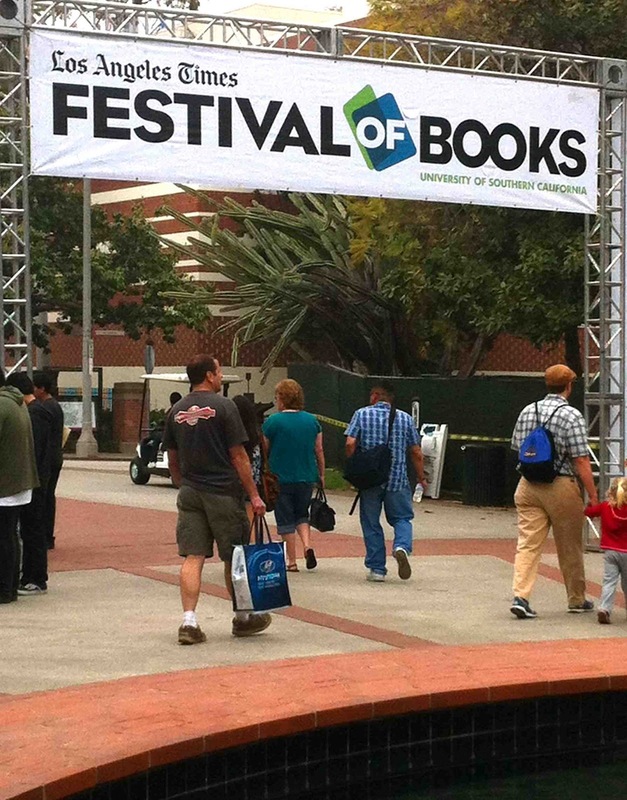 :) I wish the book festival where I live was as exciting. Thanks for sharing and the giveaway! My favorite YA contemp is Jellicoe Road by Melina Marchetta! Hi Wendy and Rachel. I love reading about these author events! We just don’t get anything like that here in Aus – well at least not where I live lol. My favourite contem YA is Kiss by Jacqueline Wilson. Wilson is one of my absolute all-time favourite authors and Kiss is one of her best YA. It’s about a girl who has a crush on her best friend, but all is not as it seems and there is a lot of heartbreak for her. A close runner up would be Wilson’s Falling Apart which was recently republished after being out of print. Keep up the good work both of you! Maree, I’ve never heard of Kiss. I love the whole best-friend thing turning into love scenario, though! I’m going to have to check that out. Is it an Aussie book? that looks like an amazing event. Wish it happened up here in Northern CA. Sounds like a blast was had by all.